While the semolina laddu is more commonly made in homes in Sri Lanka, particularly in the north, I prefer the chickpeas flour laddu. I generally refer to that laddu as the ‘Thirupathi laddu’ as the best chickpeas flour laddu I have tasted to-date is the ‘prasadam’ from Andhra Pradesh’s famed Thirupathi temple. We rarely make it at home as it is not easy to come by high quality chickpeas flour in most stores. As an amateur cook who only started taking an interest in cooking six months ago, it was not surprising that I burnt my laddu during my first attempt. I learnt that one has to be really quick during the roasting and mixing other ingredients part. 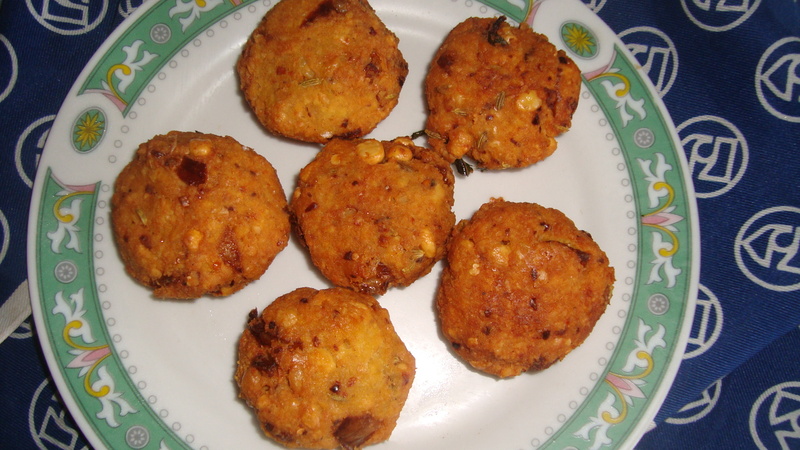 So, for today’s Navarathri festival recipe, I would like to share my mother’s recipe for the chickpea laddu. The accompanying photo is temporarily that of the photo I took of the Vajira Pillaiyar koyil ‘laddu’ and will be replaced when I take a photo of the laddu my mother makes later this week. Roast the chickpeas flour over low heat, without allowing it to burn, for about 5 – 10 mins. Add crushed cardamom to the pan. Mix and remove pan from stove. Heat the sugar and margarine in another pan, over low heat, for around 5 mins. Stir in the chickpeas flour. Add the chopped cashew nut, raisins and the optional sugar candy quickly. Do not allow flour to burn. Add 4 tbsp of hot water. Mix well and remove pan from stove. Using hand, quickly divide mixture into 8 – 10 smaller balls. Allow ‘laddu’ to cool and firm, before serving. Today’s Navarathri recipe is Boondi, a fried chickpea flour sweet that is quite popular in Sri Lanka and available in Indian sweet shops. As I like it and I do not like the too sugary consistency of shop-bought boondi, my mother occasionally makes it at home. This is my mother’s recipe for boondi. Mix the chickpea flour, wheat flour, salt, few drops of vanilla essence, pinch of kesari powder with a little water in bowl to make a batter. The consistency of the batter should not be watery nor too thick but fluid enough to be scooped easily with a spoon. When the oil is heated and ready for frying, scoop the batter with a spoon and push it through a slotted spoon over the pan so that the batter falls through in little pieces into the oil. Ensure that the boondi pieces are golden brown all over before transferring them out of a pan onto a plate lined with grease absorbing paper. Repeat until all the batter is transformed to fried boondi. Make the syrup for the boondi by stirring the sugar with ¼ cup of water in a saucepan on medium heat. Add the crushed cardamom, kesari powder. When the syrup starts thickening slightly, add a few drops of rose essence and remove from heat. Add the chopped cashewnuts, fried and split chickpeas and raisins to the syrup. Transfer the fried boondi to the syrup. Let it soak for some time before serving. 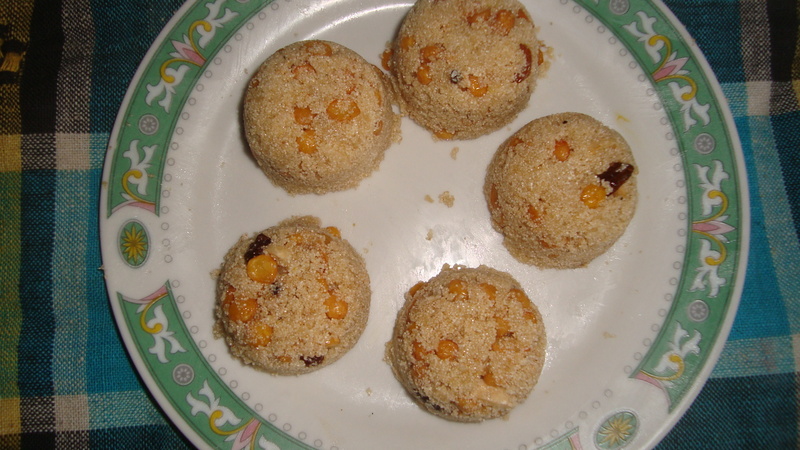 Today’s recipe for Navarathri is ravai laddu (semolina laddu). 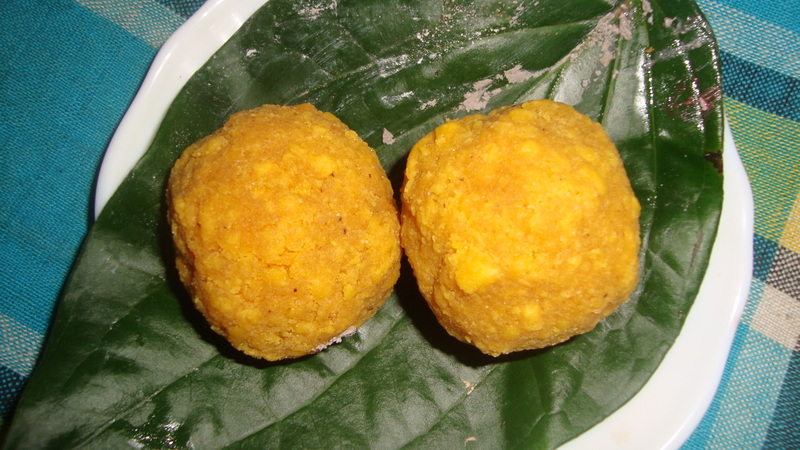 The semolina laddu is the type of laddu that is commonly made in homes in northern Sri Lanka. 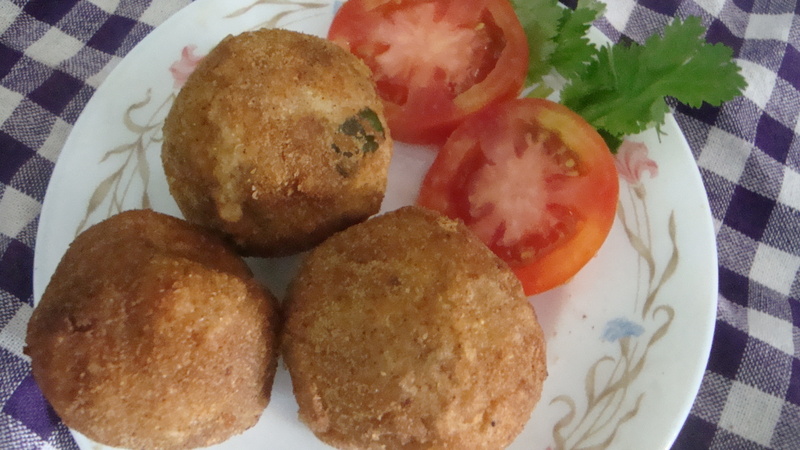 The boondi or chickpea gram flour laddu is rarely made in homes and is usually available only in Indian sweet shops. Heat the sugar and margarine in a pan for 2 mins on low heat. Add the fried, split chickpea to the pan as well as the chopped cashew nuts, raisins and crushed cardamom. Stir and cook for another 2 – 3 minutes until they have combined well. Add the semolina and stir for around 3 minutes. Increase the heat to medium and add 2 tbsp of hot water to the pan and mix well. Remove pan from stove. Scoop the mixture into a little mold and overturn to a plate. Let the laddu cool before serving. 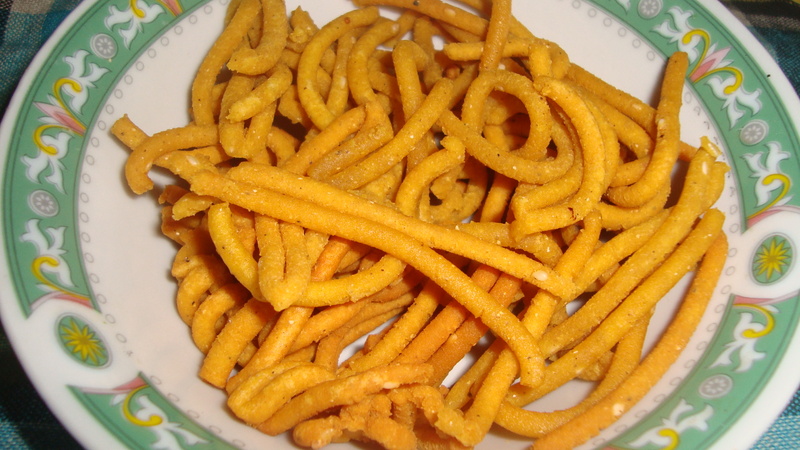 Today’s Navarathri food festival recipe is my mother’s recipe for crispy and crunchy murukku. 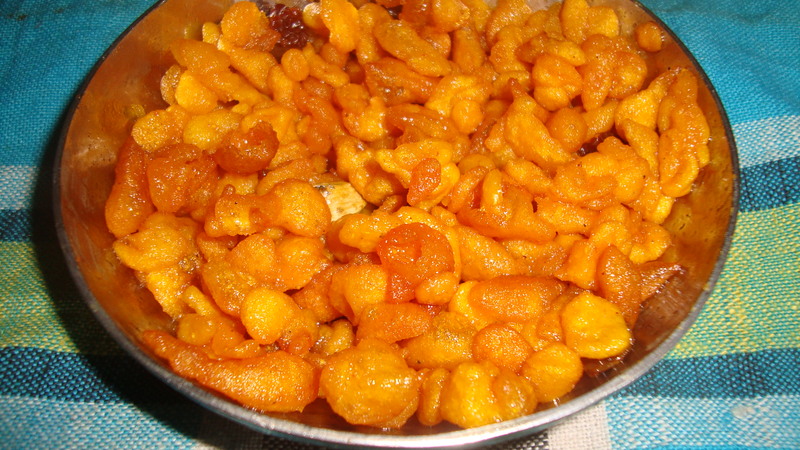 This is a delicious snack and it is usually difficult to stop eating the entire bowl, after tasting one or two pieces. Blend 2 tbsp freshly scraped coconut with 1 cup water and extract a cup of coconut milk. In a saucepan, heat the coconut milk, adding the salt, pepper and turmeric powder to the pan. When the milk boils, remove from heat and briefly cool the milk for a few seconds. In a bowl, mix the chickpea flour and the steamed wheat flour. 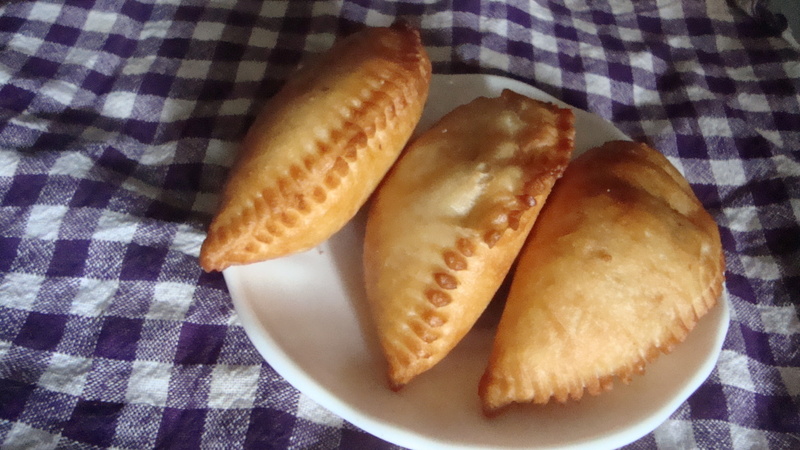 Stir in the boiled, spiced coconut milk into the bowl of flour mix and make the ‘murukku’ dough. Fold in the sesame seeds into the dough mix. Heat some low-fat oil in a pan. Scoop some of the dough into the murukku mold and squeeze out the dough through the mold over the pan with the oil. Once the noodle-like ‘murukku’ is cooked and golden brown on all sides, remove from pan and transfer to a tray lined with grease absorbing paper. Repeat the process until all the dough is squeezed out of the mold and fried. Serve immediately or store in air-tight container to prevent the ‘murukku’ from becoming mushy and to retain its crispiness.